2. Wolffhuegel Grid Glass Plate. 3. 110 mm Magnifying Lence. 4. Four Digit Resettable Electronic Counter. 5. Nett Weight- 3.5 Kgs. 1. Streamlined design enables fast and accurate count & reduces operator fatigue. 2. Hold function to stop counting at any stage. 3. 40 memory locations with data storage even after the power switch off. 4. Four Digit resettable digital counter with audio beep at every count. 5. Auto mark-Market pen probe, for counting and marking simultaneously. 6. Wolffhuegal grid glass plate. Focusing adjustable. 7. 110 mm Magnifying glass. Digital Colony Counter is designed for quick and accurate counting of bacterial and mould colonies in petri dishes. Feature packed & easy to use, this is an indispensable bench top tool for the busy microbiologist. 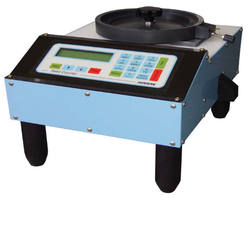 It is designed for rapid and accurate counting of bacterial and mould colonies. Simply place the pertri dish on the illuminated pad and touch the dish with the pen provided to mark each colony in turn. Packaging Carton Box , Wooden Case or as buyer's request. The colony counter that is produced by our company is a kind of digital display apparatus for inspecting bacteria automatically. It is made up of counter; probe, counting plate and the other parts,The counter is carefully designed with adopting CMOS molectron and LED digitron display.it is clear and brightness,and it allows the user to quickly and accurately count bacteria colonies while using the special probe. 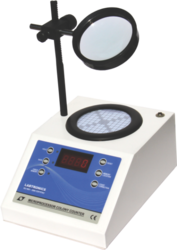 Colony contrast is clear and easier to observe.This apparatus can lighten the laboring intensity of the laboratorian,improve the work efficiency and working quality. The machine is very useful for grains and pulses laboratories where counting of Seeds is a routine requirement.